Baker went on to earn the respect from his own Republican party and from members across the aisle as a consensus builder. He had an understanding of how to make the system work. 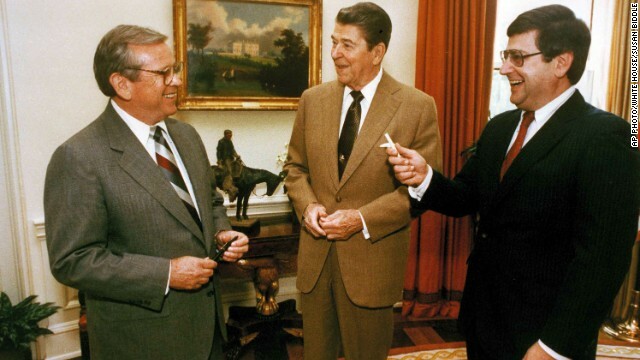 “President Reagan knew that for a successful presidency you had to have successes on Capitol Hill,” said Duberstein. Baker helped to make those successes happen. Duberstein said over the last few years, the two men frequently spoke about current partisan gridlock and wondered if today's politicians understood that governing is just as important as winning a campaign. “He was a consensus builder at a time when compromise was not considered a four letter word,” Duberstein said noting that while Baker was majority leader in the Senate the GOP only had a 52 to 48 seat advantage over Democrats. Baker’s love of politics was both for the institutions and familial; his father was a member of the House Representatives, and his first wife, Joy, was the daughter of Senate Minority Leader Everett Dirksen. Four years after Joy Baker’s death from cancer, Howard Baker married the then senator from Kansas, Nancy Kassebaum. Baker is survived by his wife Nancy, son Derek, and daughter Cynthia.